Some folks have raised questions about the green paint on the Parkway bike lanes and whether or not it will be slippery in the rain. Here's the scoop. Green colored pavement has received "interim approval" by the Federal Highway Administration for use in bike lanes and conflict zones and that if paint is used, it must meet the requirements of the 2009 Manual on Uniform Traffic Code Devices to minimize loss of traction. So, whenever the City uses federal dollars to paint bike lanes green, it must conform to those standards. The DPR is using "Ride-A-Way" paint; the same paint used by New York, Boston and Baltimore, which all have had positive results. DPR is applying three coats in areas without motor vehicle traffic and four coats in areas that will have motor vehicle traffic in addition to bicycle traffic. Green paint in bike boxes was evaluated by a research study that found while the friction was slightly lower than unpainted asphalt, it wasn't significantly different and was acceptable. Can anyone who rode on the lanes today report on how they felt? More Green Bike Lanes Coming Soon: The Streets Department is planning to paint the South Street Bridge bike lanes sometime this fall and PennDOT is going to install green bike lanes on Richmond Street North of Girard Ave (Dyott Street to the south and Cambria Street to the north) as part of the I-95 reconstruction project. 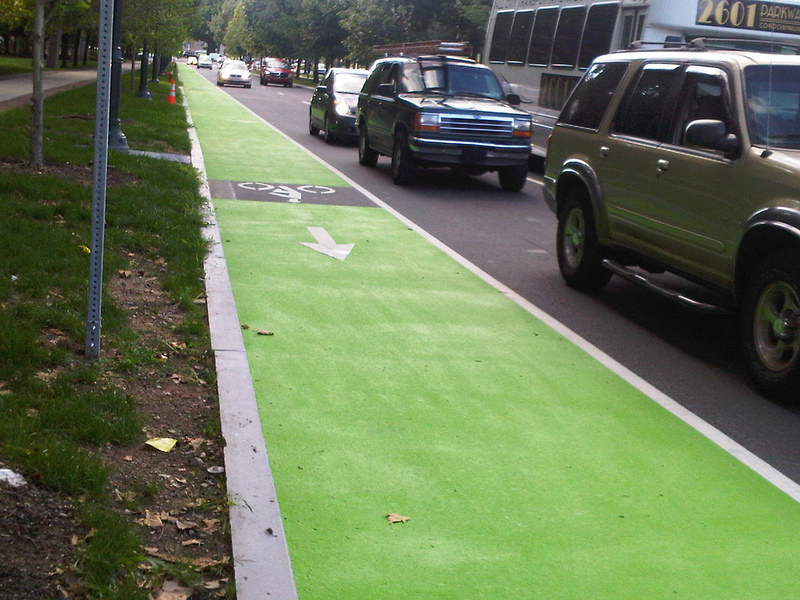 Help us out BCGP - - - Have an intern take a Field visit to test the slip resistance to the green paint! I'm curious of the result but didn't ride today. They don't seem to be noticeably more slippery than the asphalt adjacent to them.